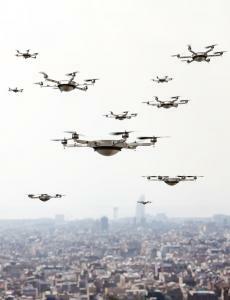 As the use of unmanned aircraft increases, rogue drones are a mounting concern. For its part, the Dutch National Police have been testing a solution. They use bald eagles to bring down drones flown in restricted areas. Eagles seem to already have a propensity for attacking drones, especially when the interlopers venture within the red zone of their nests, so the raptors seem to be performing well in early field tests. Nonetheless, it remains to be seen whether this experiment will fly or whether animal rights activists, whose feathers are already ruffled, will permanently ground the idea. In the banking industry, finding alternative ways for customers to bank also continues to take flight. For example, Capital One recently announced a partnership with Amazon that allows customers to use the Alexa Voice Service to check their credit card, checking and savings account balances, recent transactions, account summaries, pay their credit card bill and track spending. The feature works on certain Amazon devices including the Echo, a cylinder-shaped voice-activated home speaker that can also check the weather, play music and more. Capital One isn't the only bank to partner with Amazon in this area. Within the next few months, FIS reportedly plans to roll out an Amazon Echo pilot with a bank partner to test the capability. Meanwhile, Wells Fargo and Citi have reportedly also been testing voice-activated technology for some time. Of course there are limits to how customers can bank with Amazon Echo, which is why it isn't likely to be a stand-alone banking solution. For instance, it's one thing to ask Alexa for your balance while in the privacy of your own home when you know you're alone, but quite another to do so at a party when the music stops so Alexa can answer. In that situation, anyone within earshot will be able to hear what Alexa says, so users will have to be mindful of who's standing around and what might be said. Also, anyone with access to your Amazon Echo will be able to ask it questions about your account, unless you create a personal key, an extra layer of security embedded in the product. Voice-activated systems have been used for telephone banking for many years and the technology is now beginning to take off in mobile. Last year, for example, Ally Bank introduced Ally Assist. This virtual assistant responds to voice-activated requests to initiate transfers, pay bills and obtain account information, among other things. Other banks, including USAA and BBVA Compass offer similar functionality. Of course, there are limits to the functionality of this technology, which is why banks have to keep flying. It's hard to imagine customers being comfortable using voice-activation to check their balances while in line at the grocery store, for example. What's more, voice recognition software doesn't always perform its best when there's a lot of background noise. But, if your bank offers both voice recognition software and text banking, you're giving customers two convenient ways to easily check balances and transfer money between accounts while on the go. Customers can then choose which service to use in which circumstance. If you also offer them a way to check balances through their Amazon Echo or Fire TV, you've now become even more relevant to your customers by offering an extra choice. The reality is that as customers are doing more and more of their banking on the go, banks need to be able to provide an array of alternatives. Whether it's partnering with Amazon or offering voice recognition software through your own mobile app, keep flying the skies as you continue to explore. Yields rose 3bp after jobless claims data showed solid employment levels. 1) West Shore Bank ($390mm, MI) will acquire West Michigan Bank & Trust ($40mm, MI) for about $8.3mm in cash. The monthly Wall Street Journal survey of blue chip economists finds the average GDP forecast for this year is now 2.1% vs. 2.4% prior. Research by Fidelity Investments finds millennials (ages 25 to 35Ys old) say their favorite workplace benefits are: medical benefits (66%), retirement savings (59%), paid time off (57%), business opportunities (49%) and work flexibility (45%). Research by Citibank indicates the revenue impact on banks of financial technology digital disruption on US consumer banks is expected to soar from about 1% last year to 17% by 2023. Research by Citibank projects banks will cut staff by about 30% by 2025, as customers switch more and more to digital channels and away from branches. After reading the tea leaves in the March FOMC minutes, JPMorgan projects the Fed will next raise rates in July and one later in the year. S&P reports the default rate for high yield bonds jumped to its highest level in 6Ys in March, as global economies continued to struggle, oil prices declined and market volatility soared. The Financial Times reports that after thousands of job cuts over the years, large banks globally are moving to sub lease office space to reduce costs.